The Society’s next exhibition opens on Sunday 19 May 2019 with free admission on that day to all as part of the Australian Heritage Festival. The exhibition features a large and rare ‘signature’ quilt with distinctive lace insertions. The 213 hand-embroidered squares record almost 140 legible names as well as dozens of initials, decorations and place-names. 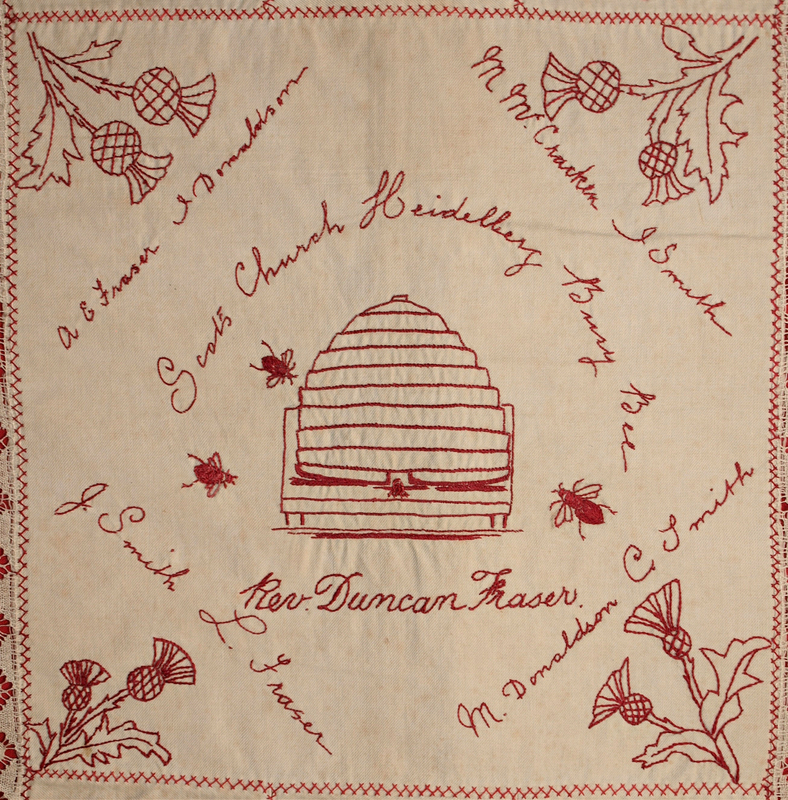 The quilt was created by a Busy Bee Society formed in 1895 by an industrious group of Heidelberg women. Their initiative raised funds for the local Scots Church. The signatures reveal social networks extending from Heidelberg to Williamstown and elsewhere in Victoria. The exhibition aims to raise awareness of a popular fund-raising strategy from the late nineteenth century, not unlike the crowd-funding projects favoured by today’s social networks. By showing connections between people from the past, it may inspire new networking amongst people who practice traditional crafts and who explore family, church and local history. The Heidelberg Courthouse Museum is open to the general public on Sunday afternoons between 2pm and 5pm. Admission $5. Free for Members and Children under 16. Special showings can be arranged for groups by contacting the museum either by phone on 9455 2130 or by email, heidelberg.historical.society@gmail.com. The Central Panel of the Quilt.